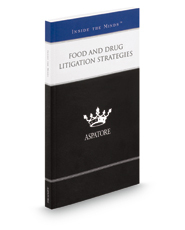 Food and Drug Litigation Strategies provides an authoritative, insider's perspective on effectively representing corporations and manufacturers in defending against food, pharmaceutical, and device complaints. Experienced partners from law firms across the nation highlight the intricacies of various food and drug cases, such as those involving labeling issues, class actions, and product recalls. These top lawyers offer key advice for preventing any potentially misleading marketing, protecting the brand during litigation, and encouraging client awareness of evolving FDA policies. From analyzing the conflict between state and federal laws to tackling an array of plaintiff allegations, these experts share strategies for navigating and responding to the challenges of recent regulatory changes. The different niches represented and the breadth of perspectives presented enable readers to get inside some of the great legal minds of today, as these experienced lawyers offer up their thoughts on the keys to success within this evolving legal field.